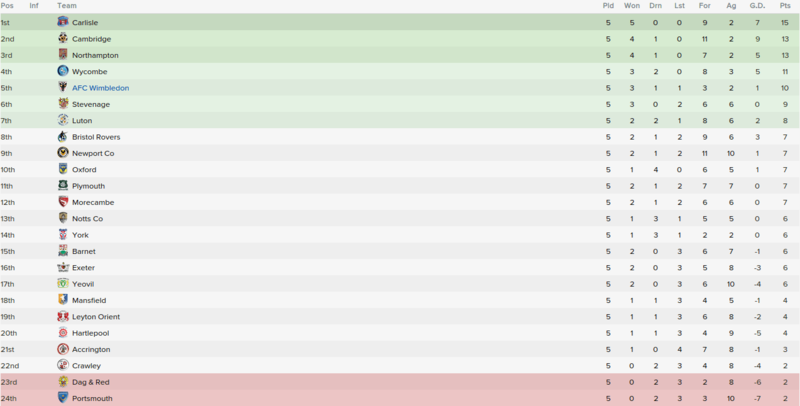 Solid pre-season. Some great signings and the fees you got for your former players is extraordinary. Today our reporters went down to Wimbledon's Moatside training ground for a one-off interview with new Wimbledon boss Dave Beasant. Beasant: "Oh, I'm loving this job already. We've had a tough start to the season, but it was never going to be a walk in the park. "We've got many new lads joining the ranks and once they settle in and all your players are happy, maybe we can start looking up. "The fans have to be patient and support the new players as they will eventually become a unit, but as with every team that takes time." Reporter: "So what are you trying to do here, Dave?" Beasant: "What am I trying to do? You see, being completely new to this sector of football, it's more positive in my eyes." Beasant: "Number one - they underestimate your ability, number two - they don't know your plans. You can easily fool managers in this league. "What I'm trying to implicate here is a unique way of playing the game at this level. I've watched games on the Football League Show of teams kicking the shite out of each other-"
Reporter: "Sorry, can we have no swearing please?" Beasant: "Yes, sorry, but anyway - I've brought in a set of players who can pass a ball, something to go against the typical physicality of this league, I'm a believer that you can't fight fire with fire, and that's what most teams do in this league." Reporter: "Thanks for your time, Mr. Beasant"
Good Pre Season. Some nice players coming in and Damian Reeves will get some goals for you. mo_123: Always loved Reeves-ey Cheers mate. 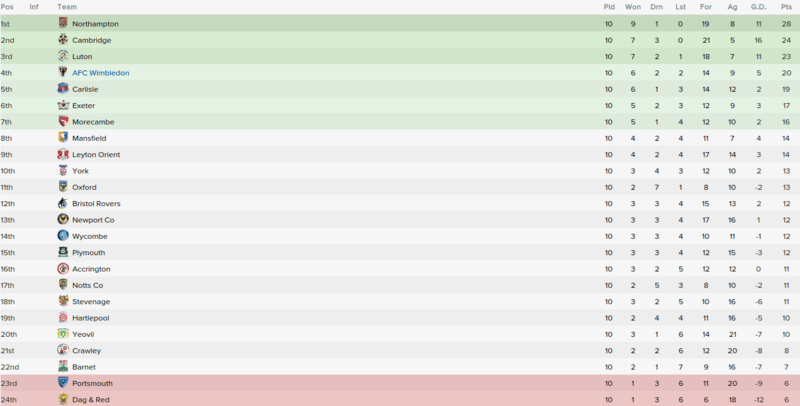 It was a great month for us, winning three league games over the course of a six game month, resulting a 50% win ratio at the end of my first competitive month in management. 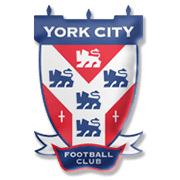 Based on preseason predictions, you'd say the Leyton Orient victory was our toughest win, but in truth I believe the draw against York was our hardest game, with the team still gelling so it was great to get a point out of that game. As you can probably see, it looks like Carlisle have the strongest squad in our league in many people's opinion - winning five out of the five fixtures. We find ourselves in quite an impressive fifth place at the end of the month, bagging 10 points going into September. The team is starting to come together, and more importantly, we now have strength in depth in our ranks. 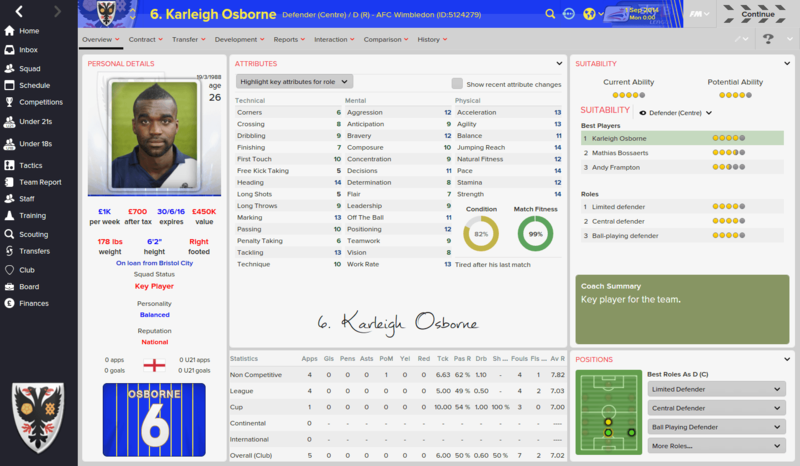 Despite our 2-0 and 3-0 losses to both Cardiff and Luton, our centre-back on loan from Bristol City most impressed me this month. The 26-year-old was able to cooperate well with two different partners at the back this month, and he was the stand-out performer without a doubt. Jak Alnwick was a close runner-up for this title, but Osborne's coordination and organisation helped him win Player of the Month for me. I am a believer that next month is very tough for us, firstly playing Carlisle - on of the strongest squads in the league. 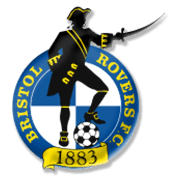 We then go onto face Bristol Rovers, who are a force to be reckoned with after their promotion from the Conference National. 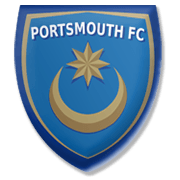 I also think Portsmouth are capable of throwing up a surprise for us, despite being at the foot of the table, but we'll focus on that game when it comes around. After Wimbledon F.C. announced it's intentions to relocate to Milton Keynes in 2001, an independent commission appointed by the FA caused the foundation of a new club by supporters against the move, AFC Wimbledon, to which most fans switched their allegiance. As so often in the Wimbledon story, it all came down to a penalty kick. In the final moments of 2012/13, Jack Midson stepped up to score from 12 yards. 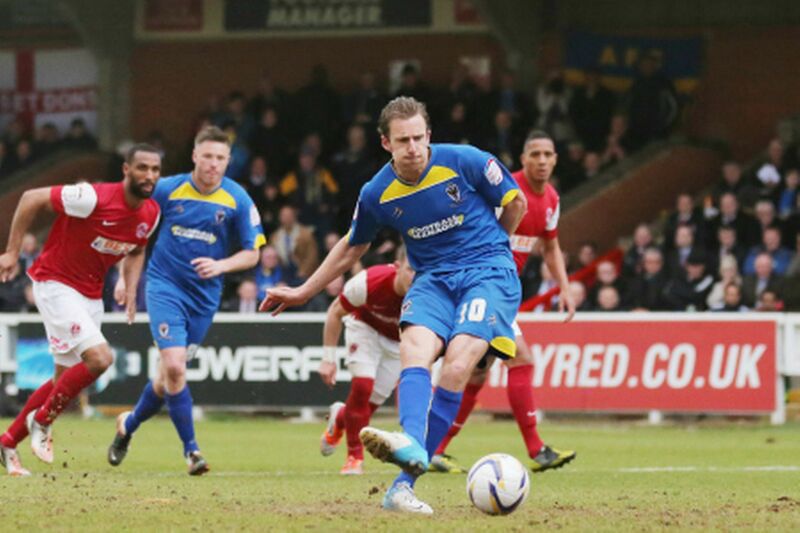 It was a goal that not only secured victory over Fleetwood Town but preserved the new Dons’ hard-won League Two status. The wave of euphoria as relieved fans invaded the pitch to celebrate evoked memories of good times past. 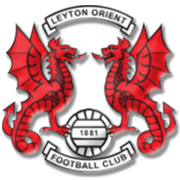 Just two years earlier, it was Danny Kedwell whose final penalty kick in the shoot-out decided the Conference play-off final against Luton Town at the City of Manchester Stadium. Such penalty heroics were hardly something new for older supporters, who remembered the saves from the spot that immortalised the names of Dickie Guy and Dave Beasant in FA Cup folklore. It was preserving that glorious past that drove followers of the club to start again in the summer of 2002 after a specially appointed three-man FA commission shocked football fans everywhere by allowing the old Wimbledon FC to relocate to a Buckinghamshire new town. Determined not to let a proud 104-year history die, Dons supporters organised themselves and within just six weeks AFC Wimbledon – a club the commission had declared would be “not in the wider interests of football” – was born. 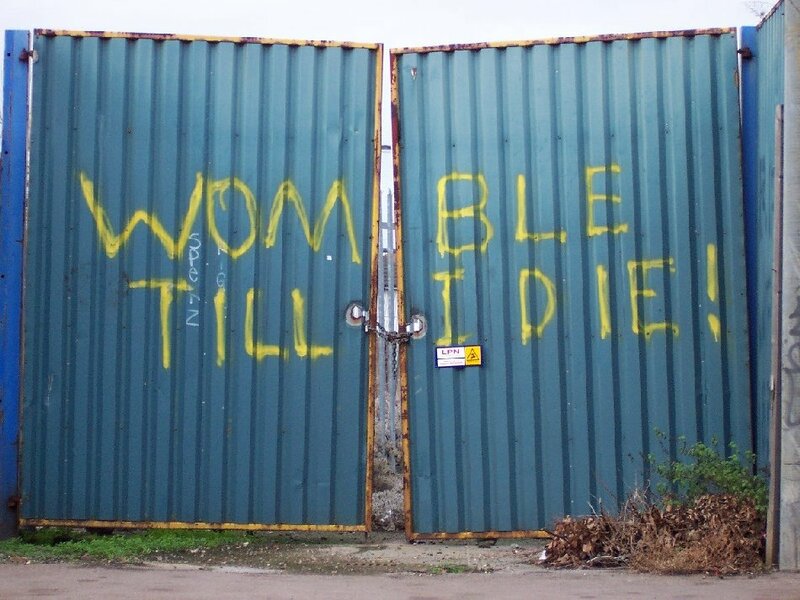 Graffiti on the locked gates of Wimbledon F.C. 's traditional home ground, Plough Lane. The new Dons’ opening match in the Combined Counties League attracted 2,449 fans to Sandhurst Town’s Bottom Meadow ground, where terracing was improvised from bales of hay. After finishing third at the end of that first campaign, AFC Wimbledon secured a league and cup double in 2004. 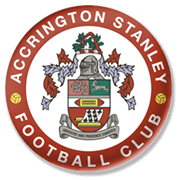 The next season they won the Ryman League First Division South before taking three years to escape the Ryman League Premier Division. Under the guidance of the experienced Terry Brown, the Dons won the Conference South title in 2008, but the Conference National proved a slightly tougher nut to crack. However, after finishing eighth in their debut season, the Dons secured the runners-up spot in 2011, and captain Kedwell demonstrated nerves of steel in that play-off final in Manchester as he fired home the decisive goal. 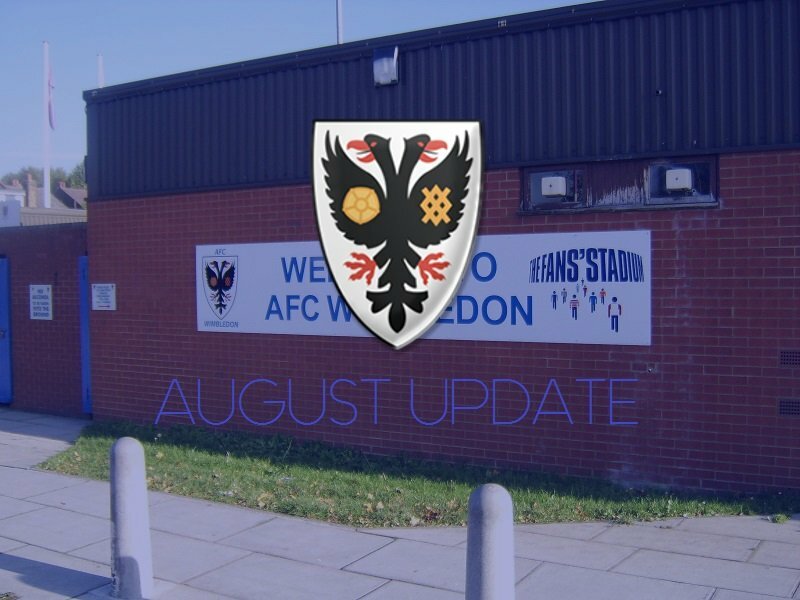 The rise of AFC Wimbledon has brought inevitable comparisons with their illustrious predecessors’ climb from the Southern League to the old First Division during the 1970s and 80s. Those days may be in the past, but the collective spirit lives on in the large numbers of fans who give up their time to run the present club. 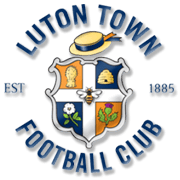 After 11 years of unbroken success, the fans are beginning to come to grips with the difficulty of trying to compete in League Two with one of the smallest playing budgets in the division. It's a brilliant story isn't it and very well told there Jack! After a 1-1 draw with Hartlepool, Dave Beasant had to learn of his striker's injury after the game. Omar Rowe netted for The Dons as they drew with 16th placed Hartlepool - with Kudus Oyenuga bagging Pools' opener at Kingsmeadow. The draw was a very entertaining one, and well matched, with The Dons firing 17 shots in on goal in contrast to Hartlepool's 12. 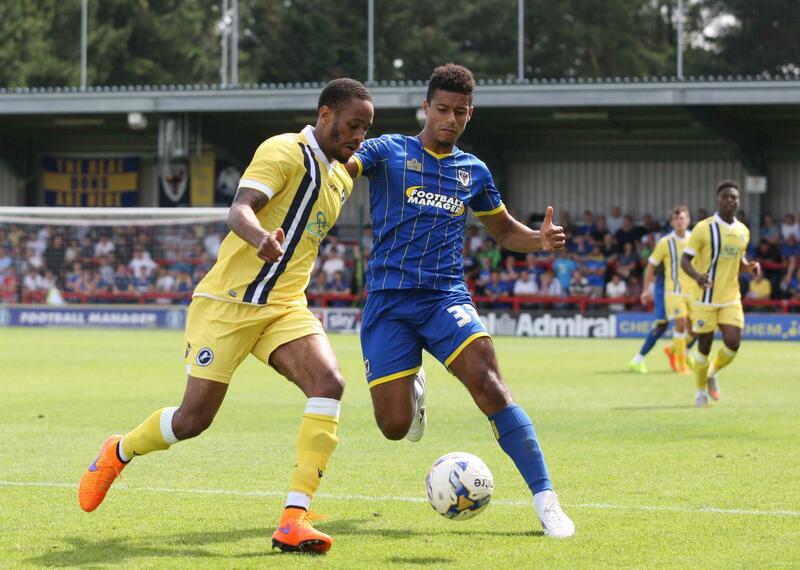 But the talking point was the robust challenge in the 55th minute from Hartlepool's centre-midfielder Brad Walker on AFC Wimbledon's Lyle Taylor. The former Sheffield United forward was down injured for two minutes as he was stretchered off the pitch by both teams' physios two minutes later, substituted for De'Jaune Taylor-Crossdale. 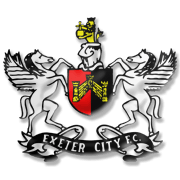 The clubs physiotherapists have now released that the star striker will be out of action for two months, after the challenge resulted in a fractured rib for the 24-year-old. It's a big punch in the stomach for manager Beasant, as the striker has been on fire in recent games - scoring seven league goals out of nine appearances for The Dons, including four against then-league leaders Carlisle United. Ah unlucky mate, just hope the injuries don't all come at once.. I like writers who take the time to research their club and tell what they know. It draws readers into the story. Well done and good luck. 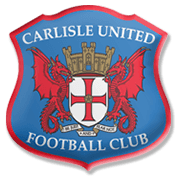 The month started excellently, with a 5-1 thrashing of Carlisle United - who were top of the league at the time of the match. 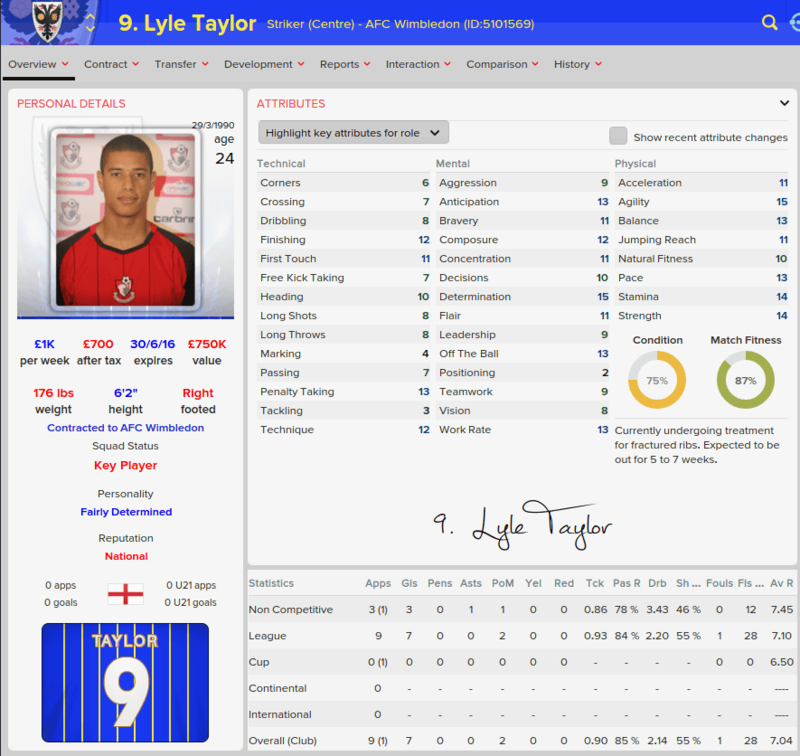 Lyle Taylor bagged four goals in this particular match. The win carried into Bristol Rovers' visit of Kingsmeadow, as a 64th minute Lyle Taylor finish won the three points for us. 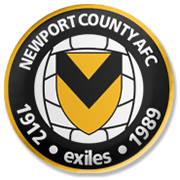 At this point, though, it was where we fell down after a 2-0 loss to Newport County at Rodney Parade. 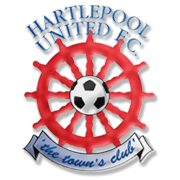 This continued as we drew to a 16th placed Hartlepool United at home, but salvaged one more win against bottom of the table Portsmouth. It came as a surprise to me that we were so high in the table at this stage! 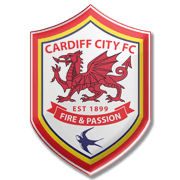 But to be honest, I can't see us sticking in the playoff places for much longer, as other teams will pick up consistency and I doubt with the quality and the amount of new players in my team, that we can sustain a good playoff campaign. Besides, I'm not sure if I would be able to handle a promotion in my first season. But we will see. Who else could it go to? I mean, he missed one-and-a-half game against Hartlepool and Portsmouth through an injury he suffered from Hartlepool's Brad Walker. It means he will probably miss all of October and maybe even some of November, but you can not fault his heroics this month. At the time of playing Carlisle they were top of the league, Lyle Taylor obviously didn't like that and destroyed them with four goals. He bagged his seventh of the season against Bristol Rovers and has been a potent threat in every game we've played. I'm not sure how to judge this month before it's started. Every side we will be playing seem very even to us, not mentioning Peterborough in the Johnstone's Paint Trophy. But for some reason, I can see a reason as to why each team we play could beat us - including rock bottom Dagenham & Redbridge. It may be negative but only time will tell if I am right.